Once again Zane Grey had turned out to be too controversial in his for his times. Once again Zane Grey uses the power of the written word to engage his audience in an important issue of his time. We aren’t just getting a romance when he writes about Tom Doan joining the buffalo hunters going into the Southwest’s inhospitable Staked Plain. Before the decimation of the buffalo herds there were probably somewhere between twenty-five to seventy million individuals (BFC) roaming the prairies. After the settlers were done with them there were probably only about 334 individuals left (FWS). Slaughter of that magnitude must do something to a person. It certainly does to Tom Doan. He finds himself baptised in blood and gore. I don’t know if the Europeans expected the Native Americans to just sit back and let them go on with their killing. After all, the bison were an integral part of the lifestyles of the plains-indians. So Tom Doan finds himself fighting the Comanches and Kiowas, other white hunters, and himself. Early on the ninth morning of that long journey Tom and Stronghurl forded the Pease River, at a dangerous crossing, and entered the zone of slaughter. 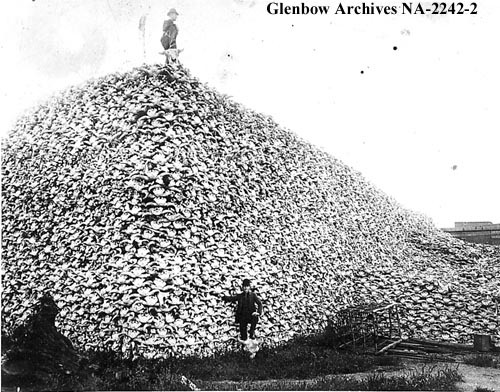 No live buffalo were in sight, but the carcasses left by the advancing hunters polluted the summer air and made of the prairie a hideous shambles. They passed thousands and thousands of bone piles and rotten carcasses; and as they advanced the bone piles became fewer and the solid carcasses more. Coyotes in droves, like wild dogs, fought along the road, regardless of the wagons. Indeed, many of them were so gorged that they could not run. And as for buzzards, they were as thick as crows in a Kansas cornfield in October, likewise gorged to repletion. The wake of the hide-hunters was something to sicken the heart of the stoutest man and bring him face to face with an awful sacrifice. Tom verified another thing that had long troubled him and of which he had heard hunters speak. For every single buffalo that was killed and skinned there was one which had been crippled and had escaped to die, so that if ever found its hide would be useless. In every ravine or coulee or wash off the main line of travel Tom knew, by investigation of those near where he and Stronghurl camped or halted at noon, there lay dead and unskinned buffalo. If he saw a hundred, how many thousands must there be? It was a staggering arraignment to confront the hide-hunters. Toward noon of that day herds of live buffalo came in sight, and thereafter grew and widened and showed movement. Tom eventually overhauled a single wagon drawn by four horses, and drew up beside it, asking the usual query. The only thing that stands between Tom and the loss of himself to despair at what his life has turned into is the love of a woman. But none of Zane Grey’s stories provide love-birds with easy resolutions and love-lives. In this case we have a step-father who refuses Milly any contact with other men. Milly slowly begins to understand (partly through contact with Tom) that all is not as it should be with her step-father’s band of non-sanctioned hunters. Blurb for Buffalo Stampede: On his first trip to the West, Zane Grey became friends with Buffalo Jones, the “last of the plainsmen” as he called him in the book he subsequently wrote about him. Jones had been witness to the great herds of buffalo that had once ranged on the Great Plains, and he had been a participant in the destruction of those herds. In early 1923 Grey decided that he would write the epic story of the thundering herds of buffalo, the great hunt that decimated them, and the battle between the Plains Indians and the buffalo hunters. At last, Zane Grey’s magnificent panorama of the war for the buffalo, and against the buffalo, is being published, just as he wrote it, violent and furious action against a background of elegiac sadness for the passing of those mighty, noble herds, the restoration of a literary masterpiece.